Our last major furniture purchase was back in our first apartment together. We had a little 1 bedroom apartment and our bedroom had no closet. Luckily we had 2 huge armoires that were able to hold lots of the husbands clothes and the tv, but when I moved in, the place had very little “style”. I couldn’t handle the “dorm room” thrown together-ness and when I came in, we went to the great Ikea for solutions! I know Ikea isn’t the most original, but it is pretty cheap and you get a lot of storage for your money in a decent style. 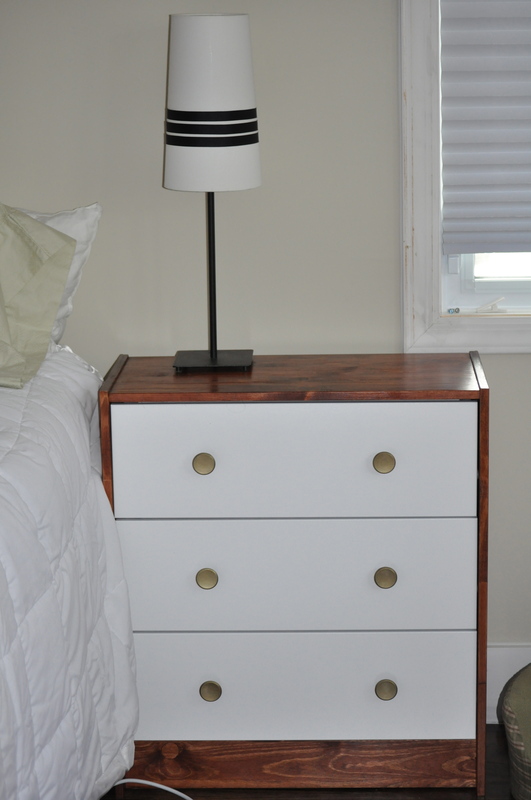 We went with the black-brown Malm nightstands and some dressers. I hated those nightstands though! They were perfect for what we needed…which is why they have been with us for the last 3 years, but I’ve been on the search for something better. In our new bedroom there are a LOT of built-in cabinets with mirrors and a cherry wood frame in arches. The floors are walnut colored. The windows frames and baseboards are white. We also have a guest room that we furnished with that old Malm stuff, so I found myself on the hunt for new nightstands again! I couldn’t make up my mind…its a problem! Everything I liked was VERY expensive. Another problem! 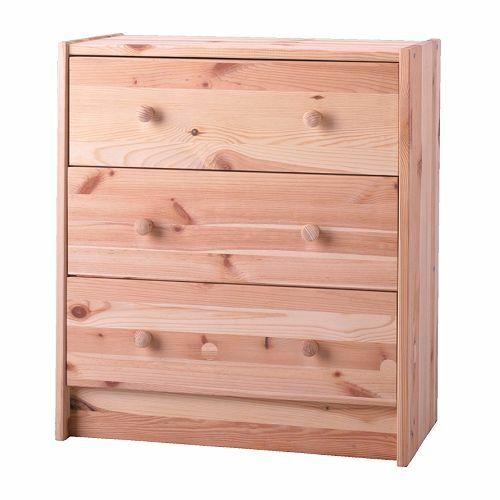 I came across a post somewhere in blog world where someone “hacked” an ikea RAST dresser. I thought…WHOA…I can make that work for my bedroom!!!! I stained the frame to match mostly to the built ins, and painted the drawers white to bring a more modern look to it. Finally, I added some antique brass knobs to coordinate with the built ins without being too matchy-matchy. Total damage to the house fund = $75 for 2 custom nightstands! The next addition to the bedroom will be a headboard that we just purchased and hopefully I’ll find a rug I like too! Job well done, LK!!! I had a hard time imagining it, but now that I see it, it looks great!!! !